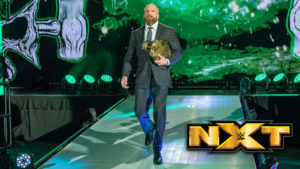 Matt Riddle and Kassius Ohno have a rematch from Takeover in a show that was otherwise a recap of the best of NXT in 2018. The final stop before NXT Takeover: War Games featured a good match between Bianca Belair and Mia Yim, and a very good match between Kyle O’Reilly and Hanson to decide whose team will get the advantage in War Games! Awe-Ska faces Ravishing Rusev Day in a fun match while Country Dominance attempts to take advantage of the newly formed Team Pawz. Fabulous Truth and Fenomenal Flair have a goofy match while B’n’B makes a real attempt to take down Monster Eclipse in a well-balanced episode of Mixed Match Challenge.